Catholicism gives a lot of importance to Saints as examples to follow, but also for their role of mediators between us mortals and God. Not for nothing many of them suffered horrifying martyrdoms, or performed surprising miracles or healings, or had the privilege to encounter Jesus or some other holy character in person during their lives. Their supposed biographies (or as experts call it, their hagiography) have often associated them to specific professions, lands, actions, objects, bodily parts or problems, hence becoming patron saints or protectors. 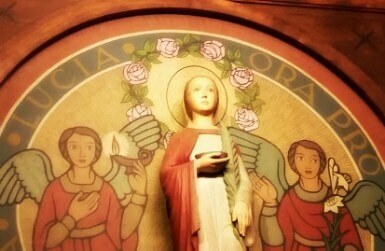 Pray to the right one, lit them a candle, or bring them a gift (be it flowers or another object that is related to the saint’s specialty), and they’ll help you get your prayer heard by the Lord. And there’s pretty much a saint for every need! Today, we are introducing you to some of the most popular ones you’ll find in the Cathedral of Barcelona. The legend says that once upon a time there was a strong giant that wanted to serve the most powerful one on earth. He first offered his services to a King, but then he realized the king was scared of the Devil. He then offered his services to the devil, until he realized the devil was scared of the Holy Cross. So he decided to work for Christ, but he couldn’t find him. One day a wise man told him that the best way to serve Christ would be helping travelers crossing a very mighty river, and so he did. One night, a young kid woke him up in the middle of the storm, asking if he would be able to help him across the river. The giant put the kid on piggyback and started walking across the river, using a palm tree trunk as a cane. When they reached the middle of the river, the kid seemed to be growing heavier and heavier, and the giant exclaimed: “Kid, you are heavier than the whole world!”. To what the child answer that it was true: he was Christ, and he carried the weight of all the sins in the world. And then he added “From now on, your name will be Christopher – the one that carries Christ”, and he disappeared. The giant then realized that the trunk he used as a cane had grown roots and the leaves were growing again. This is why Saint Christopher is considered the protector of travelers and drivers (useful to know for your vacation, isn’t it?). You’ll find him in the forth side chapel of the Cathedral to the right of the Choir – unfortunately he’s really high up and hard to see: he’s represented in one of the keystones of the ceiling. Talking about not finding things, if that’s your problem, St. Anthony is your man! The story goes that Saint Anthony had lost one of his favorite books, a commentary of the psalms, and he prayed to God to get it back. Somehow, the novice that had stolen it got arrested and confessed, and Saint Anthony got his book back. After the Saint’s death, his followers started praying to him every time they’d lose something (even when they can’t find… love! ), and since it seemed to work, we keep doing it! If you want to take a chance, you’ll find him presiding the first side chapel inside the Cathedral to the left of the Chapter Room (or Chapel of the Christ of Lepanto). Ok, so once you’ve found love… its time for babies, isn’t it? (or at least that’s what any newly-weds will be hearing as soon as they are back from their honeymoon, LOL). And that’s where Sant Ramon Nonat comes handy, as his protection will help pregnant ladies to have an easy birth. The reason is that according to the tradition and as his name suggests (nonnatus meaning not-born in Latin), St. Raymond was never “born” in the traditional way: his mother died giving birth, and he was taken out of her womb – a post-mortem medieval c-section. BTW, if you need to stop some gossiping or rumor, bring him a lock and he might help as well – or at least that’s the belief, sprouting from the story that says that during his trip to Africa he was captured by some Moors that perforated his lips with a hot iron and padlocked her mouth to stop him from preaching. Ouch! (such lovely martyrdom stories…). 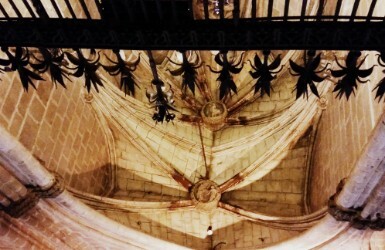 In the Cathedral you’ll be able to worship him in the Cloister, in the 4th chapel to the right of the Pietat Gate. Let me share with you a Saint that is so useful to know about when you are on vacation, or anytime that you have made outdoors plans. Because what can spoil more your trip than the rain? And that’s precisely Saint Barbara’s specialty: we invoke her to stop the storm or at least to make its effects less devastating. And that’s because after she was gruesomely martyrized, her father (on revenge for having converted to Catholicism), decapitated her but after that on his way home he was stroke by a lightning and burned to death. Nice! (*irony mode on). The lightning made her also suitable to become the patron saint of miners, because they use explosives to do their jobs – don’t miss this mining antem if you are into revolutionary music. In the Cathedral you’ll find her in the second side chapel to the right of the gate leading to the Cloister. AND BONUS! Would you like to know what saint will help you when nothing else has failed? Very helpful to know, Saint Rita is the patron saint of the Impossible Things – what means that if you’ve tried everything and nothing worked, she’s the last resort to help you achieving whatever it is. 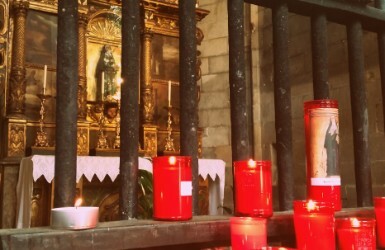 Of course, that makes her quite popular, and she is one of the saints having most candles lit in her chapel (in the Cloister, right next to the exit giving to Carrer del Bisbe). She’s specially appreciated by mothers worried about their children exam’s, LOL (funnily enough, she usually offered remarkably more candles during the exam season!). Red roses are the offering ladies bring her on her day – May 22. We also invoke her when we are given something but later the previous owner wants it back, saying in Spanish: “Santa Rita Rita Rita, lo que se da no se quita” (Saint Rita, what’s been given can’t be taken back). So what about you? Head to the comments below and tells us: what is your favorite Catholic patron saint and why? BESTIARI DE LA MERCÈ – SCARY BEASTS!